Visitors to GU Comics may only use GU images for internet-based, non-profit, personal purposes, such as personal websites, forums, and emails. GU images may in no way be used for commercial or professional ventures including, but not limited to, web sites, presentations, emails, or any form of print media without prior written (emailed) consent. Consent can only be granted by the owner/artist of GU Comics, Woody Hearn. Woody maintains a copy of all email which grants permission to commercial parties for future reference. 1. You may NOT make GU images available for download or distribution, or give permission to download or save GU images from your site. 2. You may NOT use GU images to build an image collection, archive, gallery, clipart site, mirror site, or any other project that would encourage visitors to download or save images. You absolutely may not give permission to download the images from your projects for redistribute in any way. 3. Images must be used in context and only for illustrative purposes. GU images may not be used to promote ideas contrary to the concerns of the gaming community particularly EULA violating information. They also may not be used to create or promote immoral, scandalous, or obscene material. 4. You may NOT use GU images in any project that is similar to GU Comics or competes with the services or products offered by GUComics.Com. 5. You may NOT use GU images in a project where they are the sole focus or a significant part of the project. Commission customers may use, modify, or publish their images as they see fit for any personal, commercial or professional project or for decoration or illustration purposes. You have bought complete copyrights to the images. GU Comics retains ONLY the right to use your images for portfolio (online and physical) or online commission promotion purposes. You can of course request that your images NOT be used for promotional purposes. Monthly Donators may use donation images, uneditted, for their own purposes. You may NOT redistribute the donation images for any reason with non-contributors. This protects the exclusivity of the image as a gift meant ONLY for GU Donators. All content at GUComics.Com is the property of Woody Hearn and GU Comics. All images are protected via current copyright laws. License to use GU images is only granted within the use terms above. 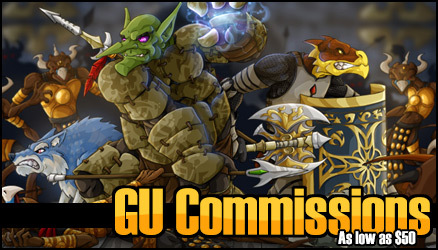 If you have questions on GU's usage terms please contact Woody by email (woody at gucomics dot com). GU images are available for licensing for commercial/print purposes. Please contact Woody by email (woody at gucomics dot com) for more information.